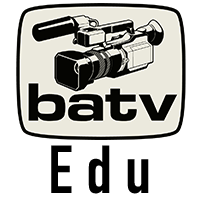 Incorporated in 1987, BATV is a membership-based non-profit, non-commercial Public, Educational and Government (PEG) access television corporation and educational / technical / media center and is located at 430 Boston Road in Billerica. As a forum for free expression, BATV members, residents and staff present and / or produce all programming cablecast on the access channels. Programming includes topics that are of interest and importance to the community and may be viewed on Comcast channels 8 (Public), 22 (Educational) and 99 (Government) and on Verizon channels 31 (Public), 24 (Educational) and 26 (Government) in Billerica or on the world wide web utilizing BATV’s Video on Demand service. We at BATV believe freedom of expression and speech are important rights and instead of restricting speech, we encourage open extensive communication while promoting diversity and responsibility. Exercise your freedom, your rights and your responsibilities.